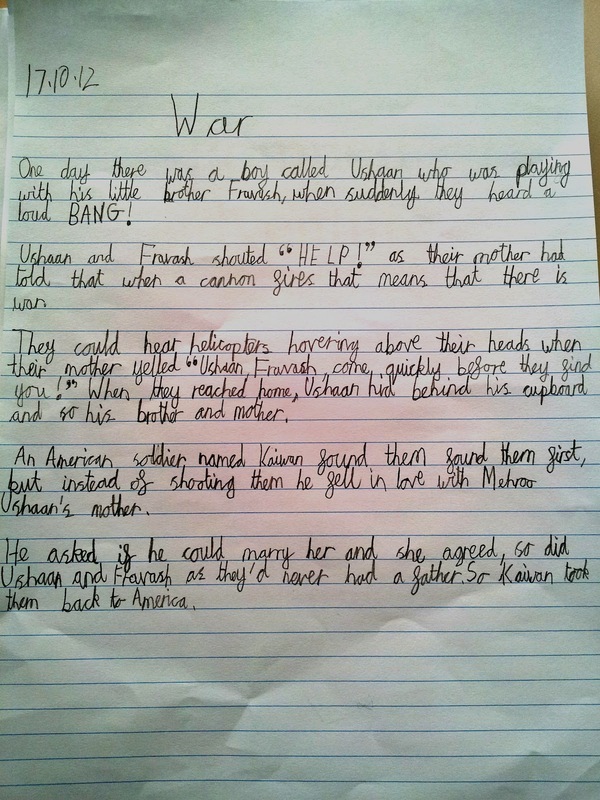 Given below are two short narratives written by my elder son who is 8 years old. Unlike our Indian education system, school books are not sent back home everyday so I happened to read these in his English draft book during our recent parent-teachers meet. My Samsung Galaxy quickly helped me capture these stories before I had to return the books. Stories that give me an insight into my son’s thoughts, his innocence, his little world comprising of his family and what took me by surprise, his sense of humour! In the near future, I see these stories taking better shape, getting more detailed and comprising of a bigger world, a world where immediate family might have to take a back-seat. A seat where I will sit and watch and judge my motherhood. One day there was a boy called Ushaan who was playing with his little brother Fravash, when suddenly they heard a loud BANG! Ushaan and Fravash shouted “HELP!” as their mother had told that when a cannon fires that means that there is war. They could hear helicopters hovering above their heads when their mother yelled “Ushaan, Fravash come quickly before they get you! When they reached home, Ushaan hid behind the cupboard and so his brother and mother. An American soldier named Kaiwan, found them first but instead of shooting them, he fell in love with Mehroo, their mother. He asked if he could marry her and she agreed and so did Ushaan and Fravash as they’d never had a father. So Kaiwan took them back to America. Ushaan and Fravash was reading a book about the volcanic eruption in Pompeii when suddenly they got sucked into the book. “Help!” Ushaan and Fravash yelled. When Ushaan and Fravash realised that they had got sucked into ancient Pompeii they knew exactly what would happen. They told everyone to evacuate to the countryside. “Everyone please evacuate to the countryside because there is going to be a volcano eruption. But no one listened to them but then they heard a loud KA-BOOM! And the volcano erupted. “Everyone run for your lives” shouted a citizen. 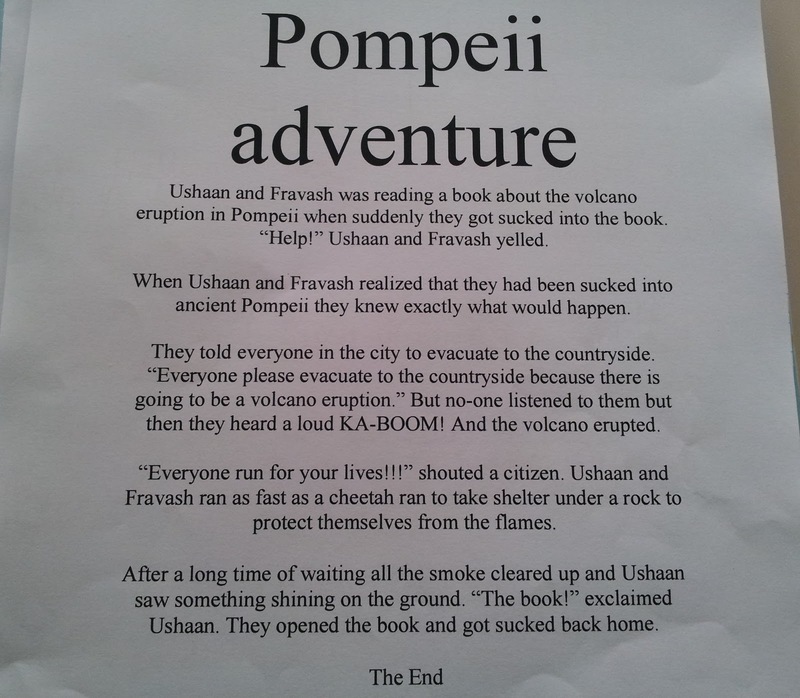 Ushaan and Fravash ran as fast as a cheetah ran to take shelter under a rock to protect themselves from the flames. After a long time of waiting all the smoke cleared up and Ushaan saw something shining on the ground. “The book!” exclaimed Ushaan. They opened the book and got sucked back home. Hi Reena, thank you for your lovely comment. I will pass on the high 5 to Ushaan!
" … but instead of shooting them, he fell in love with Mehroo, their mother." This is my absolute favourite part, what a sweet romantic he is. It is such a lovely testament to your close family life that he based his stories on all of you. Lovely! Yes he is a hopeless romantic! Will have to guard his a little heart a bit in the future :)In fact that was my favourite part too and what you have mentioned were my thoughts exactly!! Thank you.